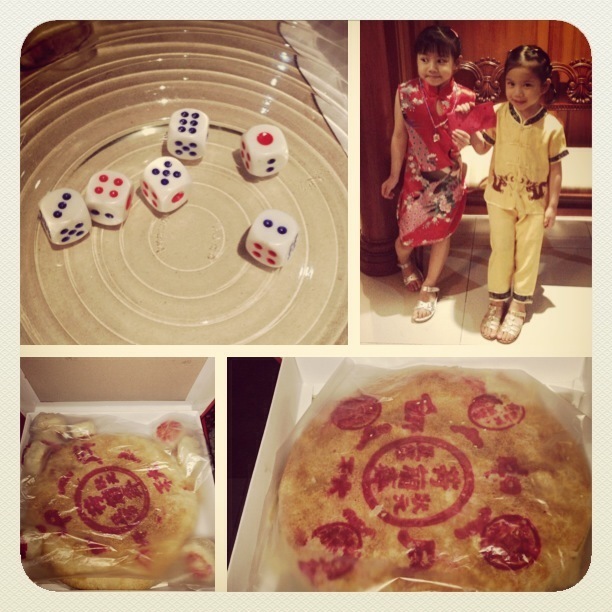 This game of chance is played during the Moon Festival in Chinese communities throughout Asia. This year, the moon festival fell on September 19. Chinese families normally hold their dice game around this date. This game is so easy that even little kids can join. The object of the game is to throw 6 pieces of dice and get a certain number combination (found in the chart below) then get a prize. 6 pieces dice with number 1 and 4 in red. All family members young and old. You’ll need to gather everyone around the table, and start throwing the dice in the bowl one person at a time. Whoever throws a winning combination is handed a prize. Prizes may be extravagant or simple. It depends on the families playing. The prizes are solicited from families joining or if its an event in school, they’ll look for sponsors. If any of the dice fall outside the bowl, you lose your turn for that round. If all the prizes for a given configuration have run out, then future appearances of that configuration win no further prizes. “Ultimate throw” – The best combination is composed of either 6 fours, or 6 ones. If you get this combination, you win ALL prizes, even those already won. Some families just give the 1st prize to ensure everybody gets to take home a prize. Other rules you can make up as you go along as long as it is fair and everybody gets to have fun. Such a simple game right? Simple yet fun!